PHILADELPHIA (AP) - A museum just days away from opening a long-awaited exhibit including two mummies and other historical artifacts from China is gutting the display of all objects at the request of Chinese officials, the museum announced Wednesday. The artifacts were part of "Secrets of the Silk Road," which is scheduled to open Saturday at the University of Pennsylvania Museum of Archaeology and Anthropology in Philadelphia. The exhibit has already traveled to museums in California and Texas without issue. Visitors to the Philadelphia museum will see a pared-down exhibit. Penn museum spokeswoman Pam Kosty said she could not offer any more information beyond a statement saying Chinese officials had requested the items not be shown. She declined to identify the officials. Attempts to reach the Chinese consulate for comment were unsuccessful because of the Chinese New Year holiday. The exhibit's main attraction is a nearly 4,000-year-old, pristinely preserved mummy from far western China, whose flaxen hair and eyelashes are still intact. A well-preserved mummy of a baby, along with vibrantly colored burial trappings of a third mummy, was among more than 100 ancient objects featured. The artifacts come from the Tarim Basin in the autonomous Xinjiang Uyghur region of China. Victor Mair, a Penn professor of Chinese language and literature, has been researching and leading expeditions in the area for more than 20 years and helped develop the exhibit. On Wednesday, Mair said in an e-mail that he could not discuss the dispute but that he hoped to continue negotiating with the Chinese after the New Year holiday. In a Jan. 21 interview with The Associated Press, Mair said "Secrets of the Silk Road" had been years in the making because China jealously guards its antiquities. Mair was especially excited to display them at the Penn museum, a regional attraction that is a hub for research but struggles to attract visitors. It was to be the exhibit's only East Coast stop. "It's going to be the rebirth of this museum," Mair said last month. "It's going to put it back on the map." As he spoke, various museum officials interrupted to report that the artifacts had arrived. Mair noted that the exhibit's Chinese chaperones would be sightseeing in the area, including trips to New York and Atlantic City, New Jersey. 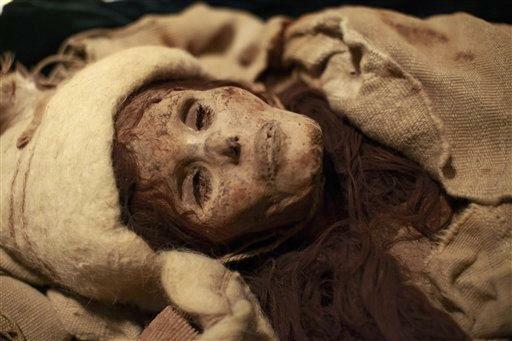 The mummies are particularly fascinating because they have Caucasian features, proving that populations migrated eastward from Europe and brought their customs and skills with them. Other artifacts include clothing, fabrics, wooden and bone implements, and even preserved foods such as a wonton, spring roll and fried dough. There were no problems for "Secrets of the Silk Road" in the four months it spent at the Houston Museum of Natural Science, where it attracted huge crowds, museum spokeswoman Latha Thomas said Wednesday. The exhibit was also displayed without incident early last year at the Bowers Museum in Santa Ana, California, museum spokesman Rick Weinberg said. Kosty, the Penn museum spokeswoman, said previously that the exhibit was expected to be a landmark for the institution, its first with timed-ticket entry. Now, several thousand tickets that were pre-sold will be refunded, she said. Instead, the museum plans to put on a pared-down display using photos of the mummies and artifacts, along with multimedia exhibits, a recreated excavation site and interactive stations, Kosty said. It will be free with regular museum admission.